Lets talk about a highly specialized application for a while, shall we ? Visual Studio is a suite of development tools for software developers while Skype is a VOIP client with chat and video functions. We all know that software developers are a lazy bunch which is probably the main reason why Keng created the Skype for Visual Studio add-in which adds the Skype chat into the Visual Studio. The first release is compatible with Visual Studio 2005 and Visual Studio 2008. The main benefit is that one does not have to switch between Visual Studio and Skype (Chat) all the time when developing an application and chatting at the same time. Please note that chatting could also be project related which would make sense in my opinion. This would provide an excellent way to copy and paste code comfortably to another user who is working on the same project. Selected code can be send to another use with the Send button of the add-in. 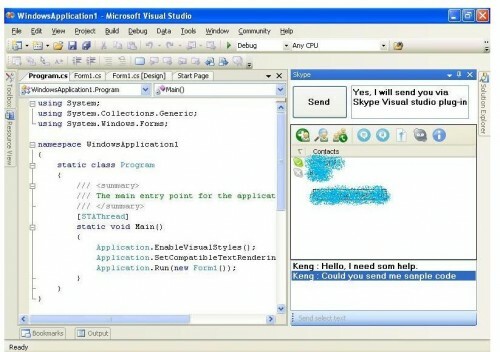 The developer is providing two versions of the Skype add-in, one for Visual Studio 2005 and the other for the 2008 version of Visual Studio. Windows XP users install the software by double-clicking the StudioSkype.msi executable while Windows Vista users have to right-click setup.exe and select to run the file as an administrator. The new window is available in the View > Other Window > Skype menu in Visual Studio.